Giveaway! 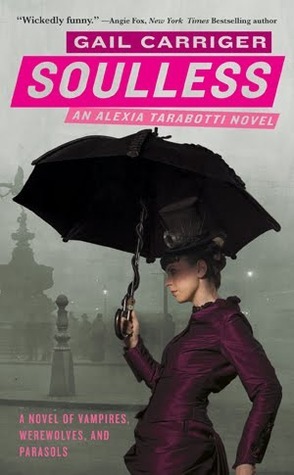 Signed copy of Soulless (Parasol Protectorate #1) by Gail Carriger! It’s been a little while, but I can’t forget about you guys! Though I haven’t completed reading this series yet (I’ll resume it after catching up with October Daye, Night Huntress, and a few new releases), that doesn’t mean I can’t give it away. I had the pleasure of meeting Ms.Gail Carriger over the summer at San Diego Comic Con, so rest assured that this is a genuine autographed copy of the book, specifically for one lucky Your Urban Fantasy follower. I am collecting entries through Saturday, October 27th. I will announce the winner the next day. Everything good must come to an end. We didn’t go for costumes on Sunday; it was just too exhausting. We like to use this time to thoroughly explore the exhibit hall, and that we did. Of course it was my priority to get Gail Carriger’s autograph and this time it worked out! So here I am with an extra signed copy of Soulless and it’s got nowhere to go…or does it? For you guys I think I might just hold a giveaway really soon! Just stay tuned ~_^. There’s not much to say so I’ll just post a few cool pics. Speaking of which, the original black ranger should easily be pushing 40, yet he looks practically the same! Well Comic Con, it was good to know you! I’ll see you next year!